Tonbé Lévé is the result of my musical experience and of life as well. Here are the 13 tracks explained! Experience #1 where 4 musicians audaciously leap toward the unknown. They delve into the groove and abstract making each individual discovery a shared experience. 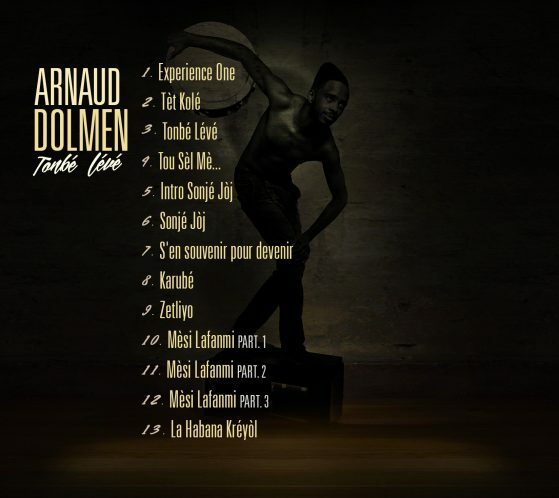 Their partner: The Guadeloupean guitarist Gérard Lockel and his range of 9 sounds. Haitian creole expression of union. It is a tribute to the dearly loved people of Haiti. Men and women, depositary of an exceptional wealth and heritage. Their pride, courage, and audacity has always been a source of inspiration. Eponymous title, it is evocative of the imagination and dreams. Let’s listen to our souls. A love music track, dedicated to life. A life that always stands by our side. All we need to do is to listen to it and to its hints. Kimbòl Graj is the first Gwoka melody I learned at Marcel Lollia’s school also known as «Vélo». Graj, the first rythm learned by Georges Troupé, is here magnified by Léo’s generosity. Tribute to Sir Troupé Georges who awakened me to the beauty of Gwoka music, the importance of lyrics, as well as silence and its spirituality. Thank you Sir Troupé! To honor our predecessors, to nurture ourselves with their vibrations, and to allows us to move ahead thanks to their spirituality. This is essential! Karubé is my vision of the bond between my Guadeloupean roots and my African ancestors. Maybe I come from Bénin like Lionel or from elsewhere. One thing is certain though, vibrations do not lie! This is the tale of my first jazz group. A friendly and surprising encounter between Jonathan and Gwenaël. In this trio, I started to compose, experiment, and escape. Zetliyo helped me build a vision of whom I wanted to become. Thank you guys! An anthem to my family. For all the cherished moments of affection, tenderness, advice, guidance, comprehension…and also celebration and joy. Wholeheartedly inspired by LOVE.